Big Data C2090-101 exam is for IBM Certified Data Engineer – Big Data certification, which is intended for IBM Big Data Engineers. 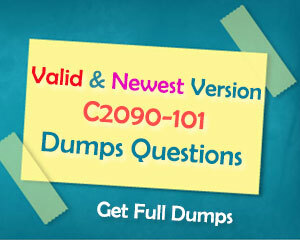 When preparing for IBM C2090-101 exam, please choose IBM Big Data Engineer C2090-101 Exam Questions for Real IBM Certification C2090-101 exam. 11. Which statement is TRUE about Big SQL? 12. Which of the following statements is TRUE regarding search visualization with Apache Hue? 13. A Resilient Distributed Dataset supports which of the following? 15. Which of the following Hive data types is directly supported in Big SQL without any changes?